I don't know what the bleep is going on in that video as far as the dialogue is concerned! I don't think it was a legit over-dub, because it's definitely a guy speaking for Ms. Rivers. And then it all seems to break down and become a free-for-all. Could it have been a commentary track, some weird kind of play by play? Joan Alexandra Molinsky (born June 8, 1933), better known by her stage name Joan Rivers, is an American television personality, comedian, writer, film director, and actress. She is known for her brash manner; her loud, raspy voice with a heavy New York accent; and her numerous cosmetic surgeries. 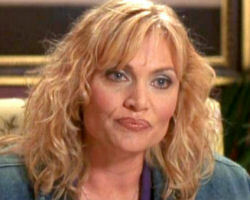 Rivers' comic style relies heavily on her ability to poke fun at herself and other Hollywood celebrities. Rivers is open about her multiple cosmetic surgeries, and has been a patient of plastic surgeon Steven Hoefflin since 1983. Her first procedure, an eye lift, was performed in 1965 as an attempt to further her career. Walter Leland Cronkite, Jr. (November 4, 1916 – July 17, 2009) was an American broadcast journalist, best known as anchorman for the CBS Evening News for 19 years (1962–1981). 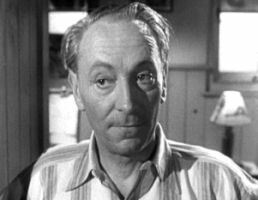 During the heyday of CBS News in the 1960s and 1970s, he was often cited as "the most trusted man in America" after being so named in an opinion poll. He reported many events from 1937 to 1981, including bombings in World War II; the Nuremberg trials; combat in the Vietnam War; Watergate; the Iran Hostage Crisis; and the murders of President John F. Kennedy, civil rights pioneer Martin Luther King, Jr., and Beatles musician John Lennon. He was also known for his extensive coverage of the U.S. space program, from Project Mercury to the Moon landings to the Space Shuttle. He was the only non-NASA recipient of a Moon-rock award. 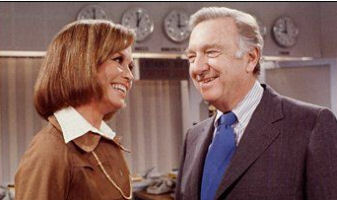 Cronkite is well known for his departing catchphrase "And that's the way it is," followed by the date on which the appearance aired. Andrija Puharich, MD - (born Karel Puharic, February 19, 1918 - January 3, 1995) was a medical and parapsychological researcher, medical inventor and author, who is perhaps best known as the person who brought Israeli Uri Geller and Dutch-born Peter Hurkos (1911-1988) to the United States for scientific investigation. Of his many books, Puharich wrote a supportive biography of Uri Geller, a paranormal case he investigated with the help of Itzhak Bentov, among others. 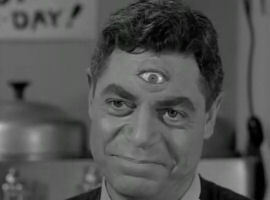 Before that he investigated favorably the Brazilian psychic surgeon Zé Arigó. He met the Dutch psychic Peter Hurkos and brought him to the United States to participate in scientific experiments in parapsychology. He also investigated Mexican psychic surgeon Pachita. He encouraged a rational assessment of people with paranormal faculties and applied scientific methods to investigations of what were their startling and often unpredictable and elusive skills or abilities. One of his books is The Sacred Mushroom, Key to the Door of Eternity, in which he describes his work with psychics, and his own skepticism of them, in some detail. 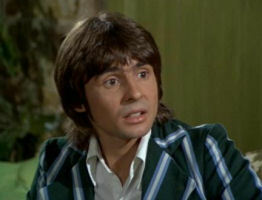 "THE DOCTOR & THE NURSE TWINS"
David Thomas "Davy" Jones (30 December 1945 – 29 February 2012) was an English recording artist, actor and businessman, best known as a member of the musical group the Monkees and star of the TV series of the same name. 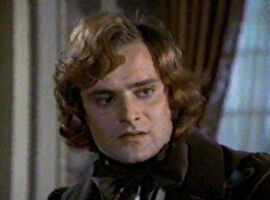 His acting credits include a Tony-nominated role as the Artful Dodger in "Oliver!" as well as roles in 'The Brady Bunch' film and television show; 'Love, American Style'; and 'My Two Dads'. 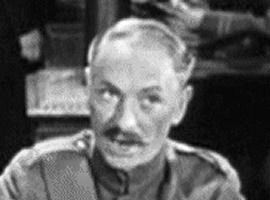 Jones is considered to be one of the greatest teen idols of all time. THE "WHO'S ON FIRST" MARATHON - TIME'S UP! 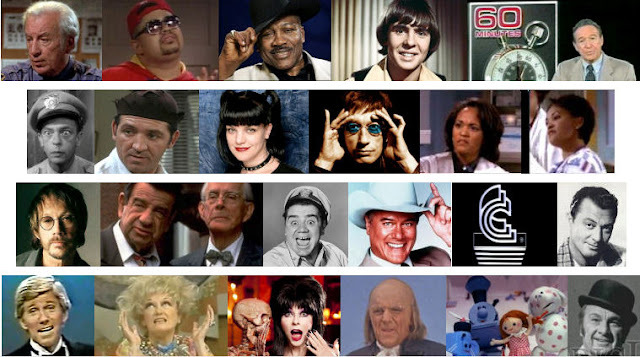 And there you have it - the fifth annual "Who's On First" celebration is completed. I hope you enjoyed it. Stay tuned for the next League of Themselves post coming up in a few minutes for January 2nd. At the end of the year we count our blessings, so there's one thing I'm thankful for that came out of the Christmas special* - The Grand Moff put the kibosh on any future crossover between 'Doctor Who' and 'Sherlock'. 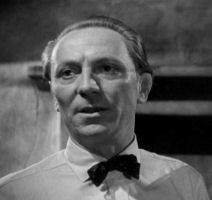 Doctor Simeon kept talking about Sherlock Holmes as a literary invention of Arthur Conan Doyle, which is easy enough to debunk and which I did in an earlier post today. But even so, Holmes was considered a character of the times - that is, 1892 (the year of such stories in the Strand as ) - and not someone of the 21st Century! 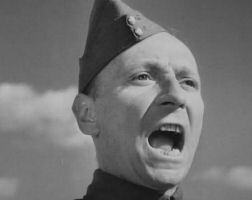 Of course, for Toobworld, that version of the Holmesian canon takes place in Limbo, the after-life dimension of such shows as the original 'Life On Mars', its sequel 'Ashes To Ashes', the last season of 'Lost' and Richard Widmark's TV adaptation of the movie 'Madigan'. So both aspects are covered, but not enough to allow a crossover, thank goodness. I'm all for Benedict Cumberbatch and Martin Freeman showing up on 'Doctor Who' - but as other characters, just as Rupert Graves (Lestrade) did. I've seen online support for the Meddling Monk as the role for Cumberbatch and I think it's a fantastic idea! And for Freeman? May I suggest that lonely fellow at Torchwood station #2 in Glasgow, that "strange little man named Archie"? *Actually there was a whole lot of goodness in this special for which I'm thankful. I trust in the Grand Moff. It is the wish of many, including myself, that one day we'll see a one-off TV movie about the Time War between the Time Lords of Gallifrey and the Daleks. 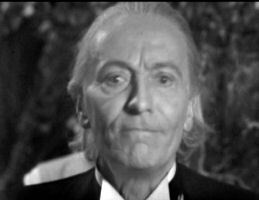 It was because of this war that the Eighth Incarnation of the Doctor had to regenerate into the Ninth. I think it could even be a theatrically-released film; it would be that popular, enough to become a blockbuster. I'd like to think that Grace was the mother of the Doctor's child, the one who would be the parent of the Doctor's grand-daughter, Susan Foreman. In order to protect his family, the Eighth Incarnation of the Doctor may have had to abandon them on some backwater planet to live safely in seclusion while he went off to fight for Gallifrey in the Time War. Arguing a point of academia with a Time Lady classmate? 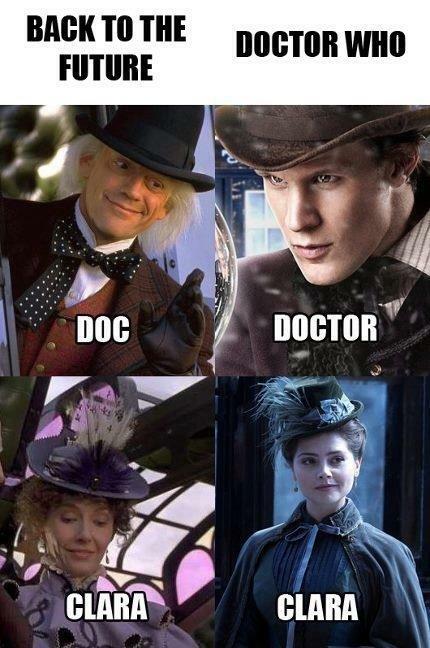 As a teacher at the Time Lords' Academy? 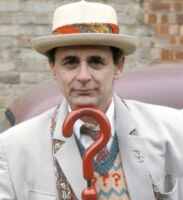 The Eleventh Incarnation wasn't the first to rock the bow tie! Perhaps the uniform was required in the Prydonian Chapter? 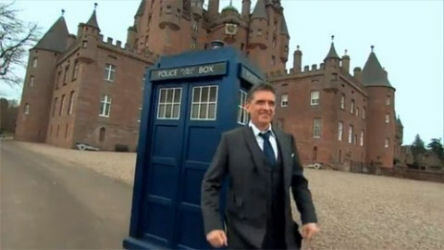 Well, he must have worn jammies in the TARDIS at some point! When 'Doctor Who' finally returned in 2005, Christopher Eccleston burst onto the screen fully regenerated; there was no tip of the fez to the Past by showing Paul McGann going through regeneration after the Time War. 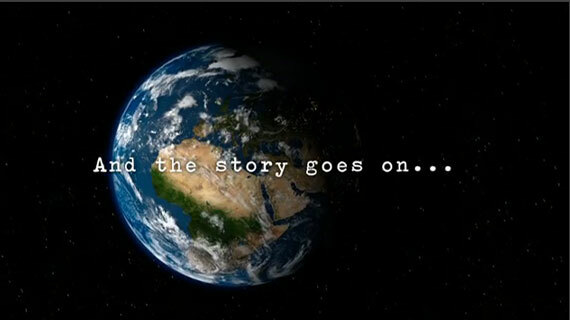 One day maybe it will be officially shown on screen in a flashback or a TV movie about the Time War. But until such time (if any!) when that happens, any one of these will do. And the rest can be relegated to alternate TV dimensions. 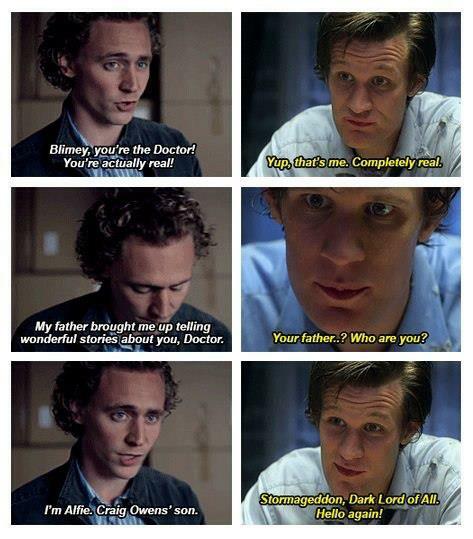 We've seen that the Doctor is not immune to the powers of the Silence. So it's entirely pozz'ble, just pozz'ble*, that one of their number has been hitching a ride in the TARDIS over the years with earlier incarnations of the Doctor. 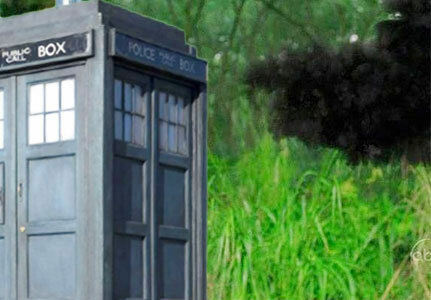 These mash-ups show us what it may have been like if the Doctors played by Mssrs. 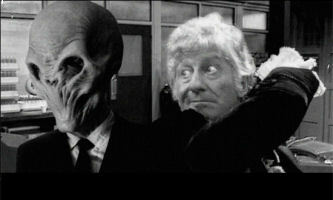 Hartnell, Troughton, and Pertwee faced off against the Silence. Of course, none of them would have remembered the encounters. I'm hoping that eventually we'll see mash-up pictures of the other Doctors as they encountered these alien invaders in the TARDIS. With the last Silence seen above, he must have been located at U.N.I.T. headquarters while the Third Incarnation was basically "incarcerated" there without access to the full capabilities of the TARDIS. I'll leave it up to you, Team Toobworld - Should the following story be considered canon? Or at the very least, as part of the Toobworld Dynamic? 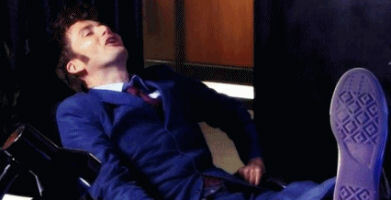 My opinion is no, it can't be a part of Earth Prime-Time, as all of those scenes already played out in other episodes. 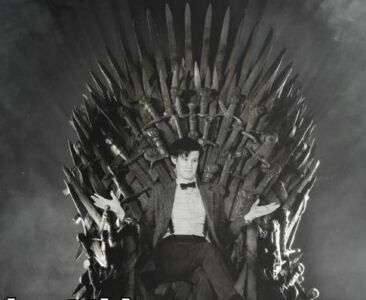 THE IRON THRONE - A NEW ADDITION TO THE TARDIS? Ever since 'Game Of Thrones' debuted on HBO, it has been the belief of the ruling Toobworld committee - that is to say, me - that the seven kingdoms of Westeros can be found on the planet Mondas, which used to share the same solar orbit as Earth Prime-Time. Also, it was created first and was the actual "Earth" ("Mondas" is supposedly an old term for "Earth") which was created by God. Earth Prime-Time is an artificial construct manufactured by the Magratheans as a special order super-computer for some pan-dimensional beings that looked like mice in the TV Universe. The reboot of the planet's populace into cybernetic humans didn't happen until near the end of Mondas' tenure in the solar system. Eventually it would break free of the orbit it shared with Earth Prime-Time and travel the galaxy until making its destructive return in the 1980s. But before that it would be home for a long line of civilizations found in other TV series but which just don't quite fit into the "history" of Earth Prime-Time. These would include the realms not only found in 'Game Of Throne', but also in 'BeastMaster', 'Legend Of The Seeker', 'Wizards And Warriors', and even a comedy like 'Krod Maldoon' (although references to Atlantis are troubling), And why not? Earth Prime-Time can be home to 'Secret Agent' as well as 'Get Smart', so why not a goofball thud and blunder "epic"? I'm still not sure about 'Conan The Barbarian'. I'm tempted to send that off to Mondas as well. But it wasn't always a world of swords and sorcery. Empires crumbled and new countries were born, and technology advanced so that magic was pushed to the side. 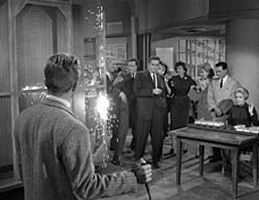 There is an episode of 'The Twilight Zone' called "Number Twelve Looks Just Like You" which supposedly took place in the year 2000. Since nothing like it came to pass on Earth Prime-Time a dozen years ago, I've relegated that episode to Mondas as well. (The year 2000 on Mondas is equivalent to the Dawn of Mankind on Earth Prime-Time.) And the replacement of their bodies was a precursor to the replacement of those bodies entirely with cybernetics. And wouldn't Arya Stark make for a fantastic Companion? 'DOCTOR WHO" & "THE VAMPIRE DIARIES"
I have no problem with this at all - if it takes place in some alternate TV dimension. As for Earth Prime-Time, perhaps it did take place during that two hundred year gap before the Doctor returned to Amy and Rory in "The Impossible Astronaut". "WHO" CAN TURN THE WORLD ON WITH A SMILE? I often wonder about the "atmosphere people" you see in the backgrounds of many TV shows, especially in the opening credit sequences of old series. This came to mind with the recent passing of Jack Klugman - who could that Boy Scout be in Toobworld? What did he grow up to become? 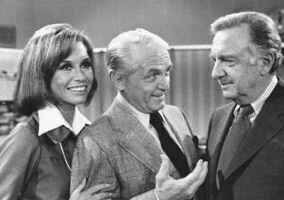 And then there's 'The Mary Tyler Moore Show' - everybody wonders about that old lady seen when Mary "flips her lid", (and she finally met Mary on a talk show a few years before she passed away.) But how about those two joggers in the park? Who were they? Mary looks back at them - did she find them attractive? Or did she notice that they both had an extra eyeball in the middle of their foreheads? The centerpiece of the garden is the Spoonbridge and Cherry (1985–1988) water sculpture designed by husband and wife Claes Oldenburg and Coosje van Bruggen. The grounds also include the Cowles Conservatory, which has more flora and sculpture inside, such as Frank Gehry's Standing Glass Fish. A pedestrian bridge, the Irene Hixon Whitney Bridge (1987), designed by Siah Armajani now crosses I-94, once again connecting the sculpture garden to Loring Park. 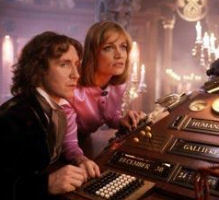 But that doesn't mean Mary Richards wasn't around when the Eighth Doctor (I prefer the Eighth Doctor in the mash-ups.) came to call. It just means that we never would have had the chance to see her on screen when he showed up. "Mayr" lived in Minneapolis until 2000, perhaps the end of 1999, when she moved to New York City after the death of her husband, local Congressman Stephen Cronin. 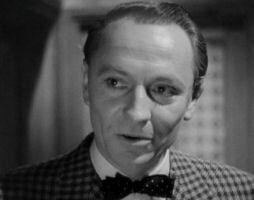 Supposedly Cronin died while he was rock-climbing. As with the splainin behind the explosion of the Klingon moon Praxis, couldn't this have been a cover story? 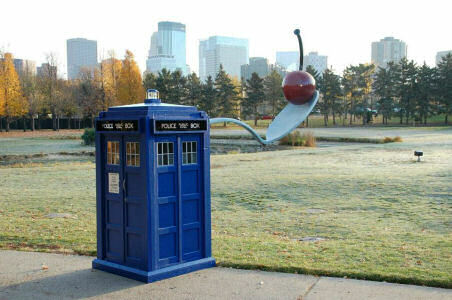 What if the Doctor had come to Minneapolis in time for Christmas of 1998* and found himself involved in some Christmasy alien threat against the Twin Cities? One that came to the attention of newswoman Mary Richards Cronin and her husband Stephen (who probably replaced Congresswoman Gettys)? Why didn't Mary mention any of this to Rhoda rather than make up a story about rock-climbing? Perhaps because she wasn't the one who made it up. Perhaps the Doctor had her bitten by a memory worm and then he created new memories for her in order to spare her the horror and anguish of the Truth. February 2000 - Events of "Mary & Rhoda"
Check out this crossover slide-show. All of the pozz'bilities are within reason - nothing is from outside the 'Doctor Who' domain. However, I think some of them wouldn't work because the Doctor expressed either suprise or ignorance at his first encounter with those involved. For example - the Fourth Doctor on board the spaceship Titanic with Leela. He could be on some other ship in the Max Capricorn fleet, but the info-angels seemed to be a new feature when the Tenth Doctor encountered them. 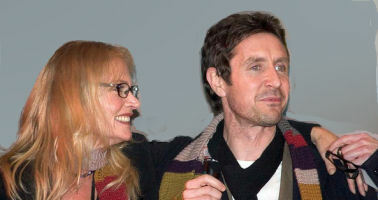 Another example - the Eighth Doctor with Madame Pompadour. As you'll see throughout today's post, I'm a big booster for Eighth Doctor crossovers, but there was never any indication from the Tenth Doctor that he ever met her before. However, in the cases of the Angels and of Winston Churchill, those are pretty reasonable ideas. In fact, a Weeping Angel might splain away what happened to Ace following the cancellation of the show in 1989. Number Nine with Syl and Number One with the Master also work. But the Fourth with the animated scarecrow would be right out. 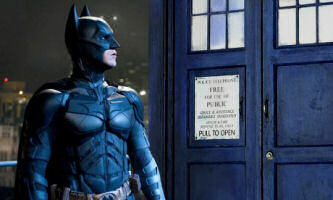 At some point during his enforced banishment on Earth without access to the TARDIS, the Third Incarnation of the Doctor might have visited Gotham City in America. There he could have teamed up with the caped crusader known as the Batman and they became friends and allies. After the Stargate team went back in Time and changed History in 1969, they came back to a new TV dimension, leaving behind Earth Prime-Time. So I have no problem with this version of events happening in some other TV dimension. Thanks to an episode of 'Shirley Temple Storybook', the world of Oz exists as a dimension accessible to Earth Prime-Time. 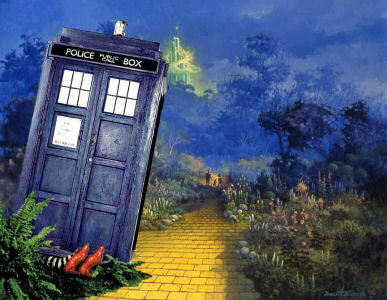 And so this mash-up picture is quite pozz'ble in Toobworld. Somehow Dorothy lost the slippers before she returned to Toobworld. So this could be the person who found them. Could it even be Glinda? 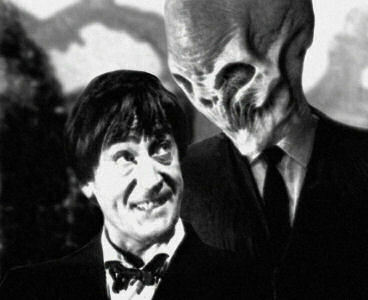 The Doctor likes to give his Companions special treats - like visits to locations and time periods they might enjoy. What if the Eighth Doctor let Dr. Holloway indulge in her fascination with the fictional version of "The Wizard Of Oz" and let her visit the actual dimension of Oz? With her own ruby slippers. And what if something went horribly wrong when he came back to pick her up? 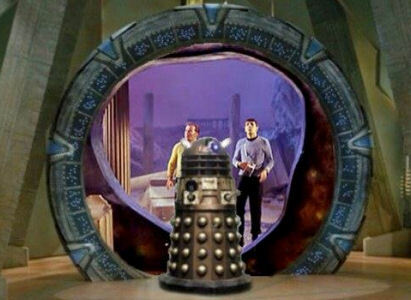 Here's another pozz'ble, just pozz'ble, suggestion for a crossover - 'Doctor Who' and 'Star Trek'. The two series are definitely connected in my mind - the TARDIS was seen in an episode of 'Star Trek: The Next Generation'. And the Second Incarnation of the Doctor has visited the planet Vulcan, from which he must have picked up those mind-meld techniques displayed by the Tenth Incarnation of the Doctor. 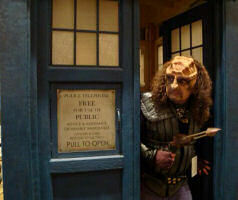 So what would be a good story for the Doctor which involves Klingons? Hu'tegh Soh if you don't! He was born in the world of comic books! He exists in the TV dimensions of Skitlandia and the Tooniverse! He is thriving in the Cineverse! 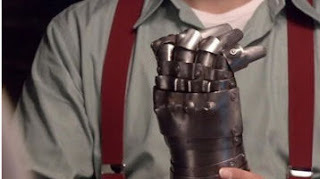 To my way of thinking, Iron Man is one of those super-heroes who would work well on TV; the technology is there to do his basic special effects. And since the movies have proven popular, perhaps it's time to get him his own live-action show. O'Bviously Robert Downey, Jr. has too much box office clout still to take on the role himself. At least on a long-term basis. But it looks like Joss Whedon is putting together a TV series pilot for a show centered on S.H.I.E.L.D. 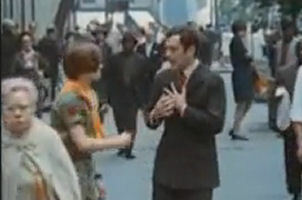 So perhaps Downey might be persuaded just to make a glorified cameo in the project. 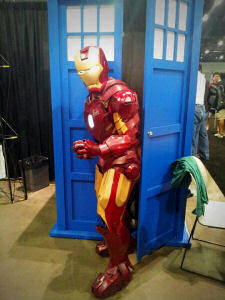 He certainly seems to be enjoying himself in the role of Iron Man/Tony Stark, so I don't see him refusing the request. What's Life like for Rose Tyler in the "Over There" dimension of 'Fringe', now that she has her Doctor? Even if it's only a human clone? This music video gives an idea - plenty of angst, love, and steamy showers! 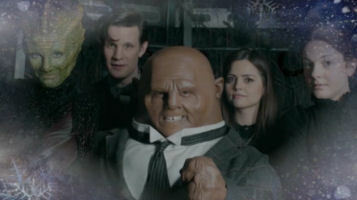 SUPER SIX LIST: WHO BROUGHT STRAX BACK? 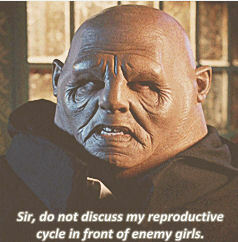 Commander Strax was a Sontaran commander who was demoted to nurse by the Sontaran Empire. He fought and died at the Battle of Demon's Run, as a reimbursement to the Doctor, whom he owed a debt to for saving his life. But we don't learn who that friend was. It could be that this is a minor mystery that will one day be revealed in a future episode of the show. Or it could be one of those little details that will only find splainin in the fevered writings of fanficcers, in much the same way as when Conan Doyle - excuse me, Dr. Watson! - left such tidbits in his stories about Sherlock Holmes, like the Giant Rat of Sumatra and the remarkable worm said to be unknown to science. I don't have much interest in the circumstances surrounding the debt Strax owed to the Doctor; there were probably hundreds of such people throughout Time and Space. 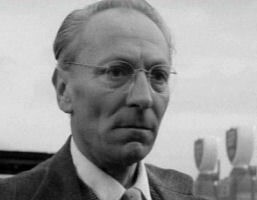 (Although I do like the idea that it was the Eighth Incarnation of the Doctor who first held that debt.) 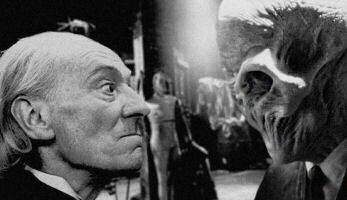 But I'm keen to learn who it was that brought Strax back to life. When the Doctor says it was a friend, that doesn't mean it has to be limited to the people in his life who could only be found in the televised canon. 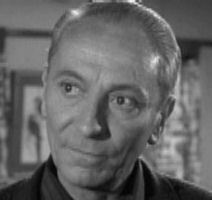 As a Caretaker of the TV Universe, I say the Doctor came into contact with lots of TV characters from other TV shows, TV movies, and even from TV commercials. At the end of the Demon's Run battle, the Doctor took off in search of the abducted baby Melody Pond. 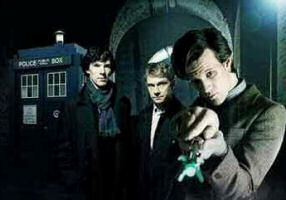 He left River Song in charge of getting the others - Amy & Rory and Vastra and Jenny - back to their respective times. I think that out of decency River would also have taken the bodies of Strax and of Lorna Bucket, a "Gamma Girl" from the Gamma Forests, who had encountered the Eleventh Incarnation of the Doctor as a young girl. In recovering the body of Strax, Rory (a nurse by training) might have noticed that Strax was only mostly dead. (Don't worry - we're not crossing over into BookWorld or the Cineverse for a visit with Miracle Max!) And so River Song might have felt compelled to mess with the established events - as she was wont to do - in order to bring the psychotic potato dwarf back to life. River Song could have taken him to Captain Jack (pre-explosion of the Cardiff Torchwood Hub) and asked him to revive the Sontaran with the Resurrection Glove. So much for staying within the confines of the canon. Nnow we're heading into the outer reaches of Toobworld to explore other options for the resuscitation of Strax. Dr. Frankenstein knew how to bring the dead back to life, and did so across the Multiverse. He may have been one of those who also owed the Doctor a debt and so was willing to use his reanimation technology on the body of Strax. 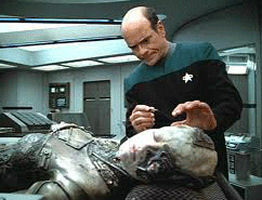 Because the crew of the starship Voyager had encountered the parent race of the Sontarans - the Heirarchy - in the Gamma Quadrant, the holographic Doctor might have had the best understanding of the workings of Strax's body, even if it had been "evolved" through centuries of cloning advancements. It would have never been a question of refusing treatment to Strax just because the Sontarans had always been hell-bent on conquering the galaxy. "First do no harm" was the tenet that travelled into space with all of the medical advancements, and so Dr. Maxwell and the android nurse Ani would have done all they could to bring Strax back from the brink. 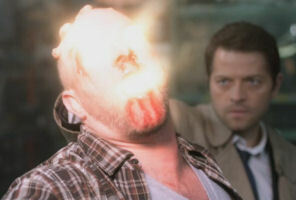 We know Max could have brought Strax back to life with his alien healing powers. 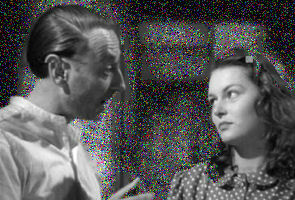 After all, he did so with Liz Parker when she suffered a fatal gunshot wound in the first episode of their series. This set the trials and tribulations of the Roswell refugees into motion. So if he can cure a fatal gunshot wound, fixing a damaged probic vent should be a snap! Not that I'm complaining, mind. The one-liners from Strax, with his obsession on weaponry as an answer to everything, was a highlight of the episode for me! THE THIRD DOCTOR OF EVIL TOOBWORLD! WHO-VIDS: "I WANNA HOLD YOUR HAND"
THE 5TH ANNUAL "WHO'S ON FIRST" CELEBRATION!